Student culture has its own traditions and customs—some lost to time, others alive and well. Here is a look at just a few of the more notable. For many decades, it was customary each fall to warn students, first-year men especially, not to walk on the Lawn. The tradition began in the years following the Civil War, when tremendous efforts were made to refurbish the University’s buildings and Grounds. 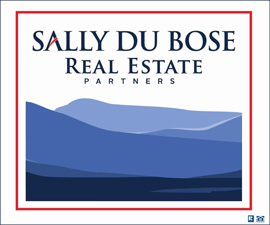 In 1870, two rows of aging locust trees that had been planted on the Lawn in the 1820s were removed and replaced with hearty maple and ash trees. A wire enclosure was also installed to prevent wayward cows from grazing on the Lawn. New gas lamps offered some visibility in the evenings, but students complained that they frequently stumbled in the dark and fell into the wire fence. Needless to say, the fence was often torn down and unsightly paths continued to be etched across the Lawn. In the winter of 1900, a posting on the University’s “Official Bulletin Board” warned students to “Keep off the grass on the Lawn.” This was followed in successive years by actual signs placed about the Grounds. An April 1950 editorial in the Cavalier Daily concluded, “Spring is Spring and grass is grass—and the former is the time when the latter should be kept off of.” While “Keep Off the Grass” warnings no longer have the status of a student tradition, it is not uncommon to find white stakes roped together marking the boundaries of the Lawn in the springtime, especially before Final Exercises. In a 1967 talk with students, professor Thaddeus Braxton Woody commented that it was distressing to see great traditions passing away: “The tradition of gentlemanly dress is slowly dying.” Woody, who had first come to the University as a student in 1919, spoke for many alumni and faculty. Shock and dismay were not uncommon reactions to the blue jeans and T-shirts that had begun to make regular appearances around Grounds in the 1960s. Though most students continued to wear coats and ties after the war and throughout the 1950s, the styles could certainly be considered more casual than they had once been. By the time the ’60s rolled around, socks had become optional, and some students considered a wrinkled sports coat with a repp tie loosened at the collar tradition enough. By about 1970 the transformation was a fait accompli—coats and ties had become the exception and not the rule. To the delight of some alumni, however, the tradition continued in the stands at home football games. Though a bridge was erected in the early 1850s over the Chesapeake & Ohio train tracks in the location of Beta Bridge, it is not the same bridge as the one so often painted today. The current bridge was built in late 1923 and opened to traffic in early 1924—the product of a citywide street paving and improvement project to prepare area roads for automobiles. Known initially as the Rugby Road Bridge, it took the now-familiar name when the Beta Theta Pi fraternity built a house nearby in 1927 (now the home of Delta Upsilon). The first documented painting of the bridge occurred in late fall 1926, when the College Topics reported that a group of students had “splashed bright green paint over the new bridge on Rugby Road.” For many years, students painted celebratory sports scores on the bridge, just as their predecessors had adorned the train trestle at the Corner since it had been erected in 1901. Sports scores remained the most prevalent subject painted on the bridge by students until St. Patrick’s Day 1967, when the now-popular tradition of emblazoning Beta Bridge with messages, slogans and graffiti seemed to take off. Painting Beta Bridge was not always the risk-free activity it is today. The bridge is city property, after all, and Charlottesville authorities in the late 1960s and early ’70s did not take kindly to having their bridge marred by University students. 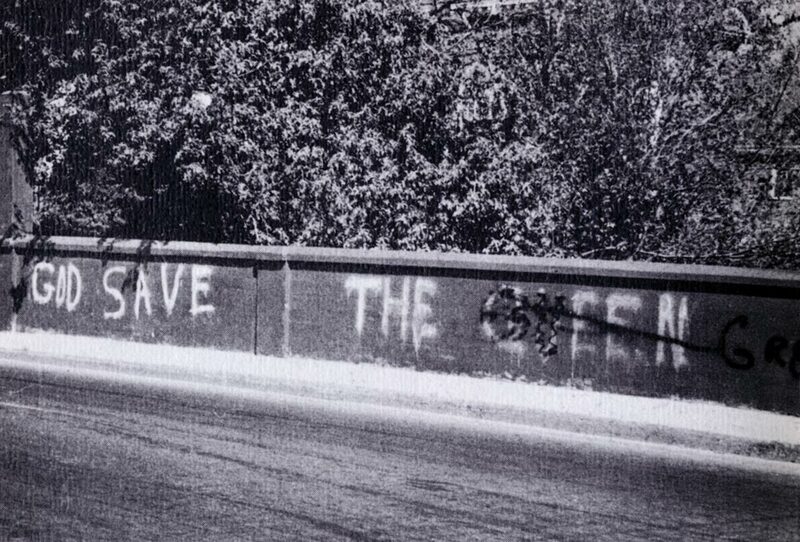 On the night of March 27, 1971, five members of the Pi Lambda Phi fraternity were arrested by city police for painting the bridge purple and gold. 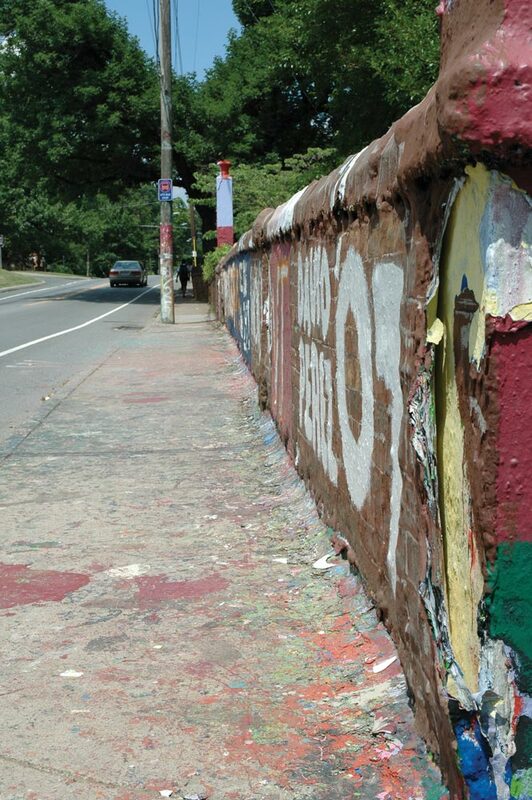 Over the years, the city has gradually acquiesced to students’ artistic talents, allowing the painting of Beta Bridge to take its place as a genuine UVA tradition. Time magazine introduced the world to America’s newest cultural curiosity in December 1973 when it described streaking as a “growing Los Angeles-area fad.” The strange phenomenon came into the nation’s living rooms on April 2, 1974, when 33-year-old advertising executive Robert Opel streaked past actor David Niven during the Oscars. But even before Opel ditched his blue jumpsuit backstage at the Oscars, streaking was alive and well at the University of Virginia. In February 1974, the Cavalier Daily reported that naked students had been seen running on the Lawn and in Alderman Library. On one memorable evening that same month, first-year students even staged a “mass streak” in the McCormick Road dormitory area, which included the University’s first documented female streaker. The students failed in their attempt to set a world streaking record. But three people did manage to get arrested for disorderly conduct. The tradition of streaking the Lawn has since gained a toehold among students at the University. 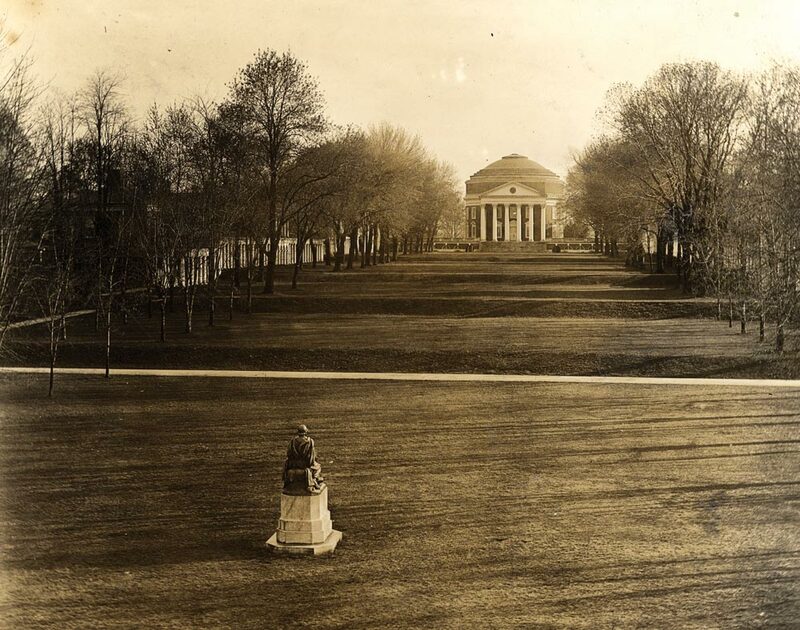 Custom has it that before one takes a degree from the University, he or she is to run naked from the steps of the Rotunda down the 740-foot Lawn, kiss the statue of Homer, and streak back up the Lawn. One version says that streakers must then peer through the keyhole of the Rotunda toward the Galt statue of Thomas Jefferson before donning their clothes. The wearing of first-year hats is a once-strong tradition that has been lost to time. Unlike the beanies seen on other university campuses throughout much of the 20th century, first years at Virginia were encouraged to wear stylish felt or straw hats. Though it was often referred to as an “unwritten rule,” this custom was clearly spelled out in the pages of the student newspaper each fall and again the following spring, when first-years had a tendency to “forget” their hats in warm weather. As new students, among them many veterans, returned to the University following World War II, the custom was put to rest. “Tradition should be flexible,” one student reasoned in 1946. “It should adjust to changing conditions. The hat convention should be abandoned graciously, without hysteria.” And so it was. Boxing began informally among students in the years before the Civil War. In 1891, William Lambeth joined the University as superintendent of buildings and grounds and director of athletics. Among his initial duties was overseeing boxing matches in one of UVA’s first gyms, a round wooden building at the south end of the Lawn. 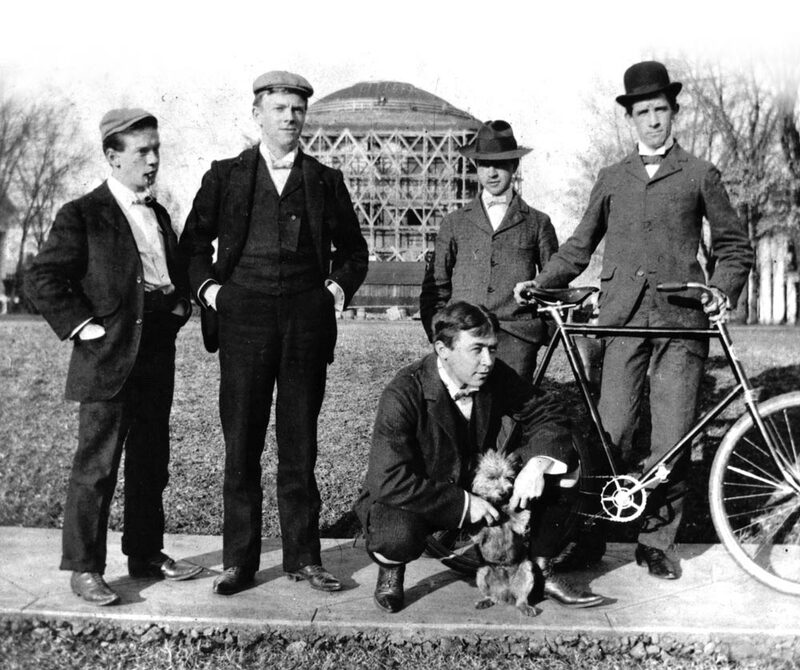 In late winter 1895, shortly after Fayerweather Gymnasium was opened, students founded a boxing club to organize Saturday-night bouts and sparring rounds. In 1904, John LaRowe, a former Marine who had learned to box in the service and had coached the sport at VMI and Washington & Lee, moved to Charlottesville to open a billiard parlor at the Corner. When the students learned of LaRowe’s boxing background, he was quickly enlisted as coach. Under LaRowe’s leadership, Cavalier boxing became a national powerhouse. 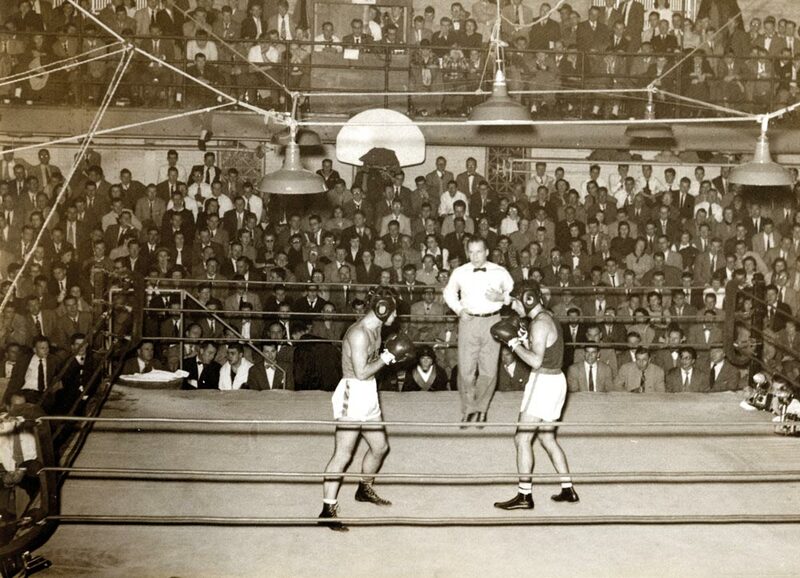 The University’s General Athletic Association (forerunner to today’s Department of Athletics) made boxing an official varsity sport in 1927, just in time to host matches in the new Memorial Gymnasium. As many as 5,000 fans would crowd into the gym to watch the bouts. The Cavaliers went undefeated from 1932 to 1936, winning a string of Southern Conference Championships. Boxing as a major college sport eventually succumbed to the growing criticism that it was too dangerous and even deadly for student athletes. (A 1950 Look magazine article described the sport as “legalized murder.”). 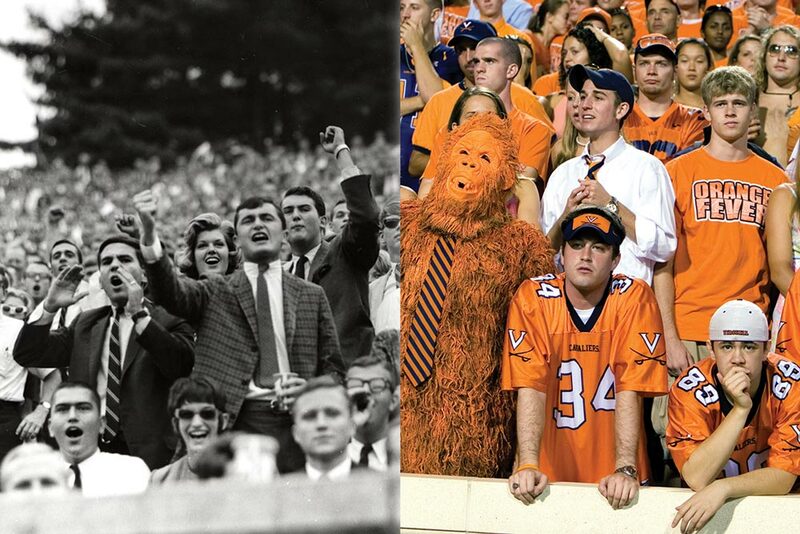 UVA eliminated boxing as a varsity sport in 1955, and the NCAA refused to sanction the sport after 1960.